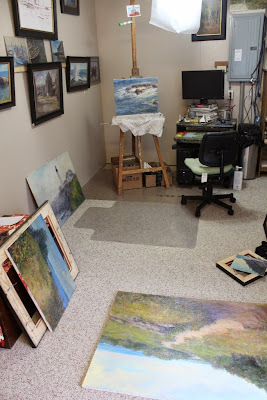 There is a lot of prep work before sending work off to a Gallery. Framing is always the most time consuming and there is no way to get around the expense. After many painful experiments with different frames, (and trying to buy cheap) I've finally learned my lesson and will not by frames from art supply companies any more. I recommend not skimping but not going overboard either. Standardizing on good frames takes a lot of the hassle away. The day before is the norm for me to get everything ready to deliver. First is varnishing each painting, I am trying Gamvar now but in the past I have used Liquin or a Windsor Newton mat varnish. Not much room left to maneuver. I also photograph each painting before putting them back in the frames. 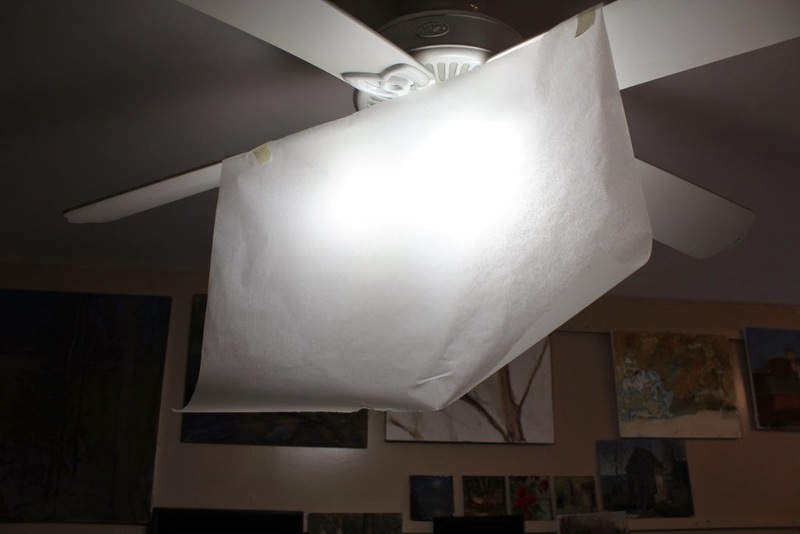 I hang tracing paper in front of the light to cut down on glare and hot spots while taking several exposures of each painting. Then I need to select the best ones and photo-edit each for the website. After this the hard work begins, I need titles... I try but I really am terrible and giving titles to the work. 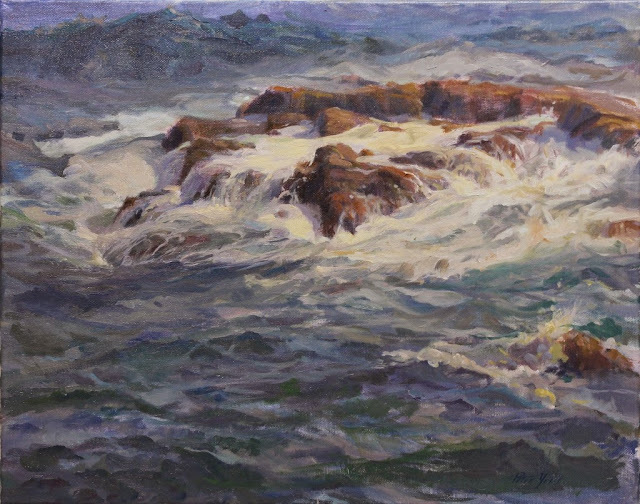 ( I'm of the "Seascape Number 14" school of thought). However, she who must not be named, has taken on most of my titles... after mine get rejected. This one I did name however. Make a list of which paintings are leaving, give them prices and make sure they are added to the database and website. Then find a box for each one and pack the car. Then wait by the phone and hope to hear of a sale or two. Hi Peter, glad to see you back here on your blog. FB is such a distraction. 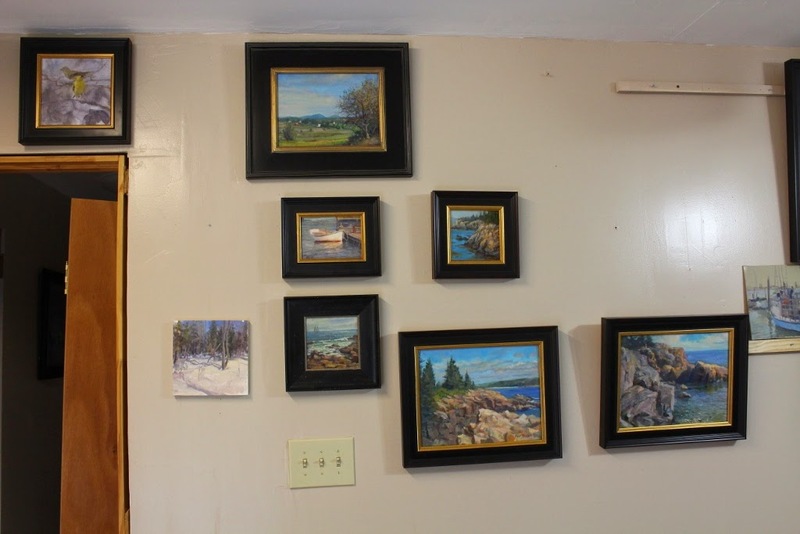 Like your frames; your paintings on the wall look great. Good luck with the gallery sales!